Planting churches and developing communities in Myanmar, where Christians face adversity, persecution and isolation. 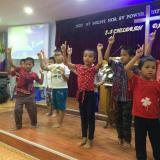 Our partners, Word of Hope, lead an Assemblies of God church which aims to share the Gospel with the people of Myanmar. The population of Myanmar is heavily populated with Buddhists. The ministry focuses on church planting and outreach work across the country and they also run the Hope Bible College as well as caring for just under 50 children in the Hope Orphanage. Christians in Myanmar face adversity, persecution and isolation. Christians are generally kept out of positions of power and influence in the country and over 3,000 Christian villages have been burned in the last 10 years. Word of Hope are tackling perceptions and barriers to bring more people to Jesus. Serving 49 children, most of which are secondary school age. The ministry aims to help each child to develop physically, intellectually and spiritually. As well as a home, the children are provided with food and medical checks as well as safe and positive environment. Myanmar, also known as Burma, was ruled for decades by a military regime which brutally repressed its minority people and stood accused of gross human rights abuses. Myanmar is one of the world’s most impoverished, isolated and secretive states which still experiences unrest. Transform the life of a child in Myanmar by becoming a child sponsor. £20 a month will provide a needy child with a safe and loving home, food, clothing and a chance to hear about Jesus.